About Rennie, Lindsey & Associates, Inc.
Rennie, Lindsey and Associates, Inc. is a custom software development company specializing in wholesale distribution manufacturing accounting software. 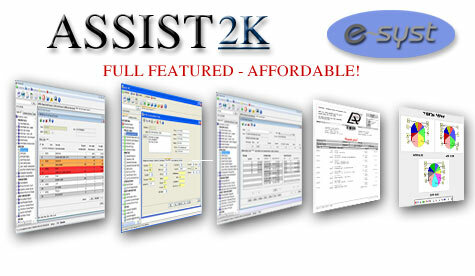 Our software products E-Syst and ASSIST 2K offer an affordable computer solution for all of your accounting and operational needs. Both E-Syst and ASSIST 2K have no mandatory annual fees and the source code can be provided. With some packages, you might pay as much as $20,000.00 (based on 40 users), or more, in mandatory annual fees. Not with RLA. We earn our money, by providing you with great service. We support our software with a highly experienced staff of analysts and consultants. Clients are assigned a personal systems analyst. Someone who will get to know your business, as well as you do. You deal with the same person each time, not some random stranger who knows nothing about you. Support staff is available 24 hours a day, 365 days a year. Support calls are normally returned within 20 minutes. No one else can offer you the quality, integrity, and depth of experience you will find from the folks at Rennie, Lindsey and Associates. Contact us at 877.886.1642 and see! As a "software developer", we have a tremendous advantage over a "software dealer". We know our product inside and out, because we wrote it. If you want our software to do something new, we know how to make it happen. If the software needs to be modified, we know the best approach to take. No other company can offer you a better fitting software product for your business than the folks at RLA, because we know how to tailor our software to fit your needs. Now you say, "but I am purchasing E-Syst or ASSIST 2K from one of your software dealers." RLA is available to do custom work on your behalf, but your local dealer also has the same access to our understanding of the software. We can advise and guide our software dealers in the best approach to changing the software. No other company can offer a better assurance of getting you what you need for your business. Dealers of other software packages do not have this kind of access. They can not speak directly to the authors. They do not want to do custom modifications, because they cannot do them. So it is easier for them to tell you no and recommend an expensive upgrade. Those kind of software dealers are not bound to stay with the product they sold you. They can change packages at any time and leave you hanging. Are custom mods going to prevent you from upgrading? At RLA, the answer is no. We institute a strict policy on how to do custom mods. It is our goal to keep you current on E-Syst and ASSIST 2K, and migrate your custom mods to each new version. It really is not that hard to do. We reserve areas in the program and file structures for custom modifications. When you upgrade, those modifications stand out like a sore thumb. We cut and paste them into the current release. Each year we upgrade many clients. They go to the current release and take all of their custom modifications with them. RLA specializes in software for wholesale distributors and manufacturers. That's all we do. We staff experienced consultants that will quickly know your business inside and out. Some of our clients have used the same software for as long as 15 years. How is this kind of return on investment possible? Well, we constantly improve our product. You benefit from that. If your business has a pressing need, you simply ask us to make a change. We don�t throw out your software and replace it with new and expensive software. We enhance the areas that need it and leave the rest of your software alone. No expensive purchase, disruption and re-training of your staff. Some businesses are replacing their accounting software every 4 years. Can you afford to do that? Our typical client has been with us around 10 years. They could have gone anywhere else during that time, but they chose to stay with RLA. Why? Because we are there helping them -- year in and year out -- to make the most of their software investment. We do the things they need to stay ahead of their competition. They get the benefit of our MIS experience without having to staff an entire MIS department. By using our services our clients can concentrate on their business -- not their business software.